If you’re like me, you’ve Googled something like “comic book script format.” Or “graphic novel writing structure.” More than a few times. I never find what I’m looking for, precisely. What about you? Maybe you want to make sure your story is in the format editors want. Or maybe you’re tired of the screenplay way of doing things, and you were looking to see if anyone found a better way. For a long time, writing the graphic novel script seemed like an exercise in futility. But I’m getting better and better at making the process work for me. I’m not an expert. But I wanted to share a couple concepts that shaped my thinking, and made writing for comics more fulfilling for me. As usually happens in different disciplines, a vague term can take on a different meaning in each. So in screenwriting, there’s one meaning for the term “beat.” And in acting, there’s a different meaning for “beat.” And then of course, those are just metaphors derived from the meaning of “beat” in music. The acting-oriented definition is something like this: a phyiscal change that communicates a change in information to the audience. So for example, if an actress sits down because they don’t know what else to do with herself, it’s not part of the story structure. Not that the audience can tell. But if the actress sits down and the audience understands that she is sad, or has a secret, then that’s a beat. So, the two senses of “beat” are related. But I have found that I can lay out a page of panels way better if I can separate the two in my mind. I try to think of whole pages as screenwriter-beats. And I try to think of single panels as actor-beats. I know I used to make the mistake of including to much information in a single panel. The more I can limit a panel to one beat, the clearer the story will be to the reader. As described in Mastering Comics, cartoonist Alison Bechdel uses a method she invented. It arose out of the need to be able to pace the beats of the story visually. A need I can relate to. 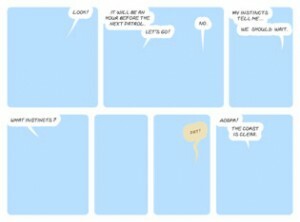 She uses Adobe Illustrator to lay out panels and word bubbles before drawing the comics. Before generating that empty comic, I had an outline to work from. But, rather than thumbnailing the comic strip, like I usually do, I just went right into Photoshop. Using this method, it’s pretty easy to nudge the gutters and reorganize the word balloons. You can test the flow of it, try different approaches — and not have to redraw anything. Using Bechdel’s basic concept, I broke up my dialogue differently. The timing makes more sense. Would I have solved this problem using my normal method — just doing a few iterations of a thumbnail? Maybe. But using this process, I had the added bonus of a ready-to-go template. Other Graphic Novel Script Writing Techniques? I’m still collecting other trains of thought on this topic. For instance: what are the similarities and differences between story-boarding a movie, and thumbnailing a comic book? If you have strategies or topics to suggest, I’d love to get a dialog going.